제자들은 예수께서 바다 위로 걸어오시는 것을 보고, 유령으로 생각하고 소리쳤다. 그를 보고, 모두 놀랐기 때문이다. 그러나 예수께서 곧 그들에게 말씀하셨다. "안심하여라. 나다. 두려워하지 말아라." But when they [the disciples] saw him [Jesus] walking on the lake, they thought he was a ghost. They cried out, because they all saw him and were terrified. Immediately he spoke to them and said, "Take courage! It is I. Don't be afraid." 폭풍우와 두려움 속에 갇힌 우리 곁으로 예수님께서 지나실 때에는, 우리 스스로 두려움과 필요를 깨닫도록 기다리시다가, 최악의 악몽 속에 있는 우리와 함께 지내시면서 그 악몽을 통과하도록 도와주십니다. 믿기 어려울 정도로 놀라운 사실은, 예수님께서 사용하신 말씀이 "안심하여라! 나다(역주: 영문으로는 I Am)"라는 것입니다. 하나님께서는 구약시대 출애굽기 3장에서 자신을 스스로 있는 자("I Am") 라고 모세에게 드러내셨는데, 이스라엘 백성들의 울부짖음을 들으셨고 그들의 역경을 보셨으며 이제 그들을 도우러 오신다는 것을 모세에게 알리실 때 쓰신 이름이었습니다. 예수님께서 이제 우리에게도 똑같이 말슴하십니다! In the middle of our storms and terror, Jesus passes close by, just waiting for us to acknowledge our fear and need, so that he can join us in our worst nightmares and help us through. 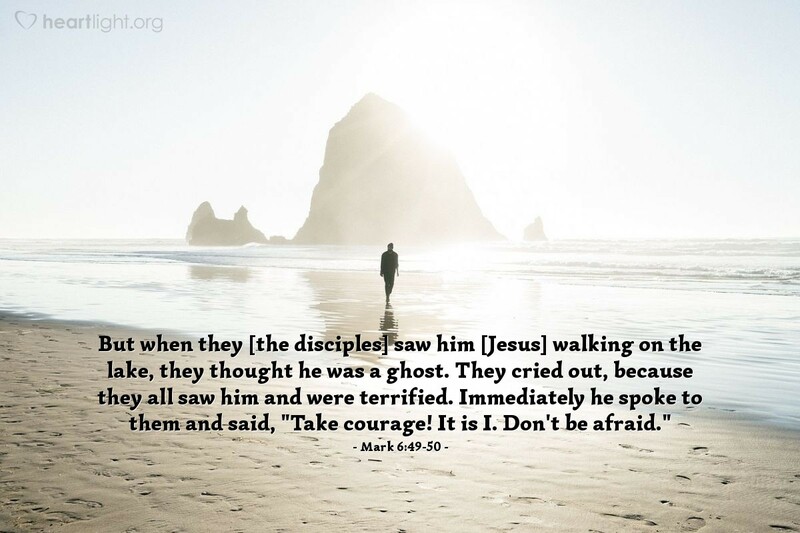 Incredibly, Jesus' words here are literally, "Take courage! I Am." God revealed himself to Moses in Exodus 3 as I Am, reminding Moses that he heard the cry of the Israelites and had seen their hardship and was now coming down to help them. Jesus does the same for us! 오 하나님, 함께 계시고 가까이 있어주시며 고통과 두려움으로 울부짖는 제 비명에 항상 응답해주시니 감사드립니다. 주님과 주 예수님을 제 삶 속 더 활동적인 부분에 초대하지 않으려 하는 저를 용서해 주시옵소서. 주님께서 옆에 계심을 아는 저에게 주님의 임재를 알리기만 하지 마시고, 매일의 제 삶 속에서 주님을 변두리로 밀쳐내려는 저를 부드러운 손길로 막아주시옵소서. 예수님의 이름으로 기도합니다. 아멘. Thank you, O God, for not only being there, but being close by — always waiting to respond to my cry of distress and fear. Forgive me for not inviting you and the Lord Jesus daily into a more active role in my life. I know you are near, so I ask that you not only make your presence known, but that you will gently confront me when I push you to the periphery of my daily life. In the name of Jesus I pray. Amen.